I did many macarons the other day and I wanted to try an other filling. Pink Lady and Salty Caramel. I wanted to follow the recipe of Christophe Felder but my book was at home and that weekend I was away. So I just inovated and try something, it wasn’t bad at all. Peel and cut the apple in tiny peaces and cook with 40g of sugar and about 10cl of water for 10/12mn until it makes a puree. Reserve in a cold bowl. Prepare the salty caramel. Add the rest of the sugar and water in a pan, bring to boil until it starts to get a slightly brown color, add a few drops of lemon and the mascarpone slowly and carefully as it will make a reaction due to the temperature difference. Add the salt. Mix the caramel and apple puree. Keep it cold in the fridge before starting to fill your macarons. 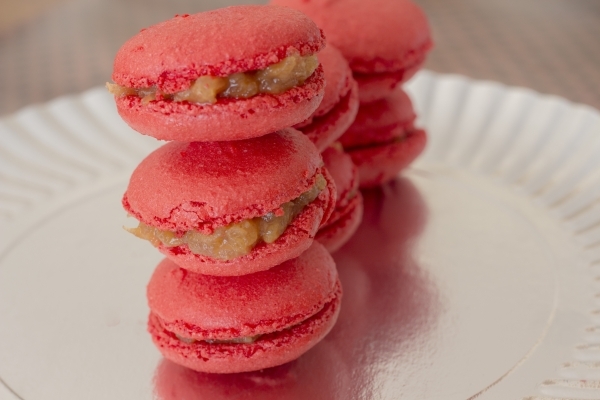 Fill your macarons and reserve for 1 day if you can resist easting them.